The graph below, and our thanks to Boeing, dramatically shows the improvement in reducing the noise footprint of aircraft in this period of time. It is for the freighter variants, but the passenger aircraft figures are much the same. There is more to the story. 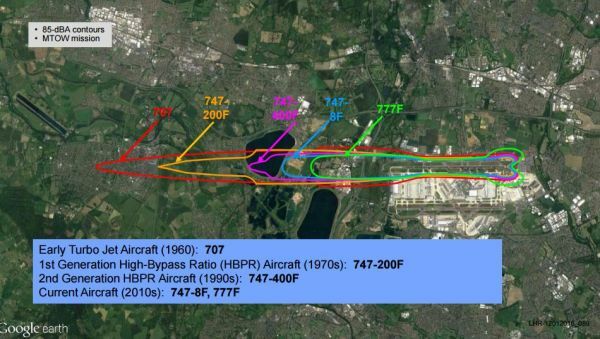 While HACAN is often painted as the hero in these matters and Heathrow the villain, the airport is playing a not-inconsiderable role in noise control. It is keeping up not-so-subtle pressure on the airlines with incentives to fly quieter aircraft into the airport and by publishing its 'Fly Quiet' league table, the latest issued on 15 November, ranking 50 of the airlines on the noise they do make. The BA short-haul fleet tops the league table, while Etihad Airways and Qantas have moved into the top five quietest, super-quiet Airbus A350 flights have more than doubled and Boeing 787 Dreamliner flights have risen by 19%. This follows Qatar Airways becoming the third airline to fly the A350 into Heathrow, while Singapore Airlines has climbed 21 places to 19th, thanks to its own cleaner, quieter aircraft and improved performance. Qatar’s introduction of the A350, which made its debut last year, joins Finnair and Ethiopian on the London route, increasing the daily number of A350 flights to six. The A350’s noise footprint is about 50% smaller than its predecessor models and Airbus claims is contributing to a better noise environment for local communities. Twenty-one of Heathrow’s airlines have ordered A350s. Meanwhile, Dreamliner flights increased from 6,300 to 7,500 over the three-month period to October. As for the BA short-haul fleet, the airport’s biggest, the airline reports “exceptional performance” thanks to noise-reducing enhancements to its Airbus A320s and operating procedures that take noise over the ground into consideration.